Germany has said it could withdraw its troops from Afghanistan if tensions escalate in the region as a result of a US-led war on Iraq. Defence Minister Peter Struck told a news conference on Friday that a contingency plan had been prepared for the evacuation of its civilians and military forces from the region. The comments were made after the UK Financial Times newspaper quoted a confidential German Foreign Ministry report indicating mounting hostility towards the peacekeepers, even among the Afghan Government's security forces. Germany and the Netherlands formally took command of the International Security Assistance Force (Isaf) in the Afghan capital, Kabul, on 10 February. 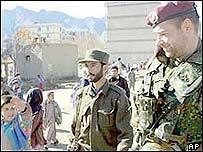 The 22-nation 4,800-strong force has maintained security in the Afghan capital since its deployment in December 2001 following the ousting of the Taleban regime by US-led forces. Although Kabul's security situation has improved considerably, there have been several attacks on foreign soldiers in recent weeks. And violence continues to plague Afghanistan's many provinces where armed factions and gangs fight for control or booty. Mr Struck mentioned the continuing danger from dispersed al-Qaeda and Taleban supporters during a brief visit to Kabul to attend the 10 February handover. But correspondents say Berlin has not previously drawn attention to a threat from forces under the control of the Afghan Government. The report quoted by the Financial Times warns that troops from the anti-Taleban Northern Alliance could damage Isaf's work in Kabul and block acess to the air base in Bagram. It adds that the security situation in Kabul could worsen further in the event of military action in Iraq. A war could increase sympathy for terrorist groups and lead to more intense terrorist activity in Kabul, the report says. Germany has 10,000 troops deployed in operations abroad, more than any country except the United States. Mr Struck also said on Friday that the Defence Ministry would save approximately 3.2m euros over the next 10 years by buying fewer aircraft and reforming the navy. Some of the savings would be used to focus efforts on operations abroad, he said, because German territory would not be under threat "in the foreseeable future". 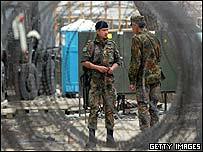 The cuts come despite recent Nato and EU calls for increases in military spending.